There are currently 87,114 users on this website. just wondering if anybody can give me info on this. I know they go by weight and metal analysis but I only got an ounce scale. it is suppose to be around 27 grams and it weighs .9 ounces so it is close. does it visually look right?the real question is I want to know if it is worth sending in for grading or send it back to the seller. to CCF. Nice pics. Give it a bit and members will help you. I am no expert, but this coin looks ok to me. As far as sending it in. NO. This is a nice coin, and you got it for a good price, but there is no upside in it. It will not considerably appreciate in value by being entombed in TPG plastic. Your shipping cost alone would negate any minute gains that TPG authentication would bring. Yes, this is the right forum for this kind of question. Welcome to the Forum. You've come to a phenomenal place to share and learn. Enjoy!! You might find this useful while you wait for more comments. thanks jgenn, that link was very useful. 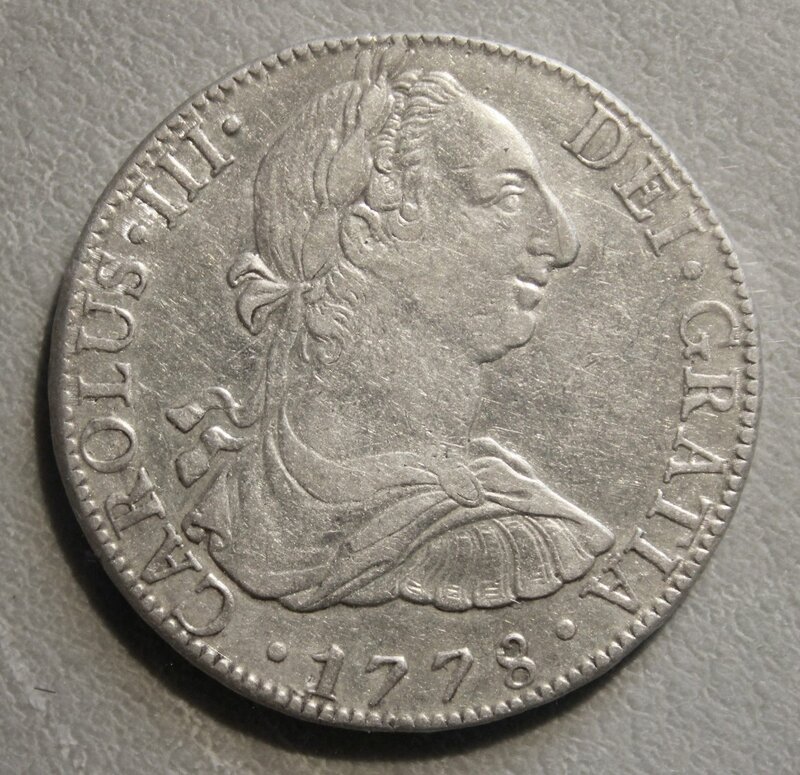 another question I have is there a price guide somewhere that is pretty good for these 8 reales? 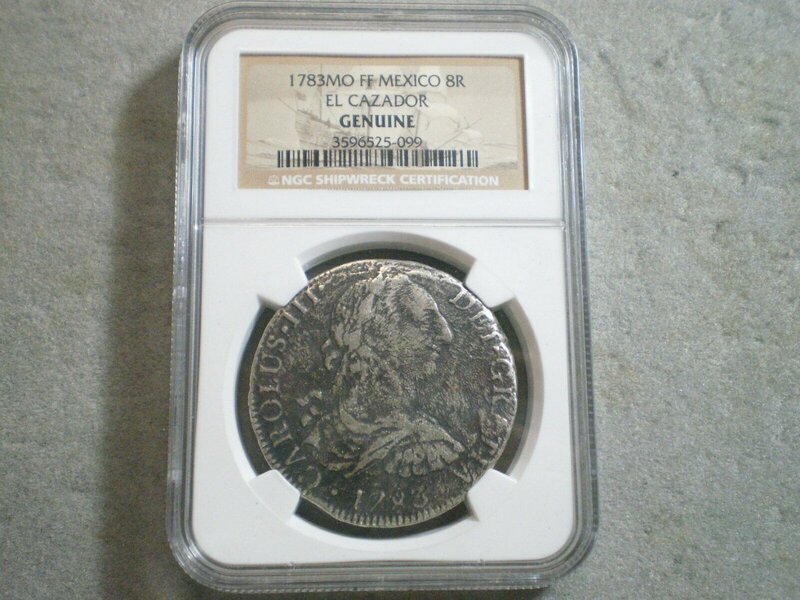 also I just purchased another one(see pic) that is an NGC certified el cazador coin for 103$ I like that I already know its genuine and the history of the el cazador is great. Was this a good price for an el cazador coin and is there a price guide for these coins? 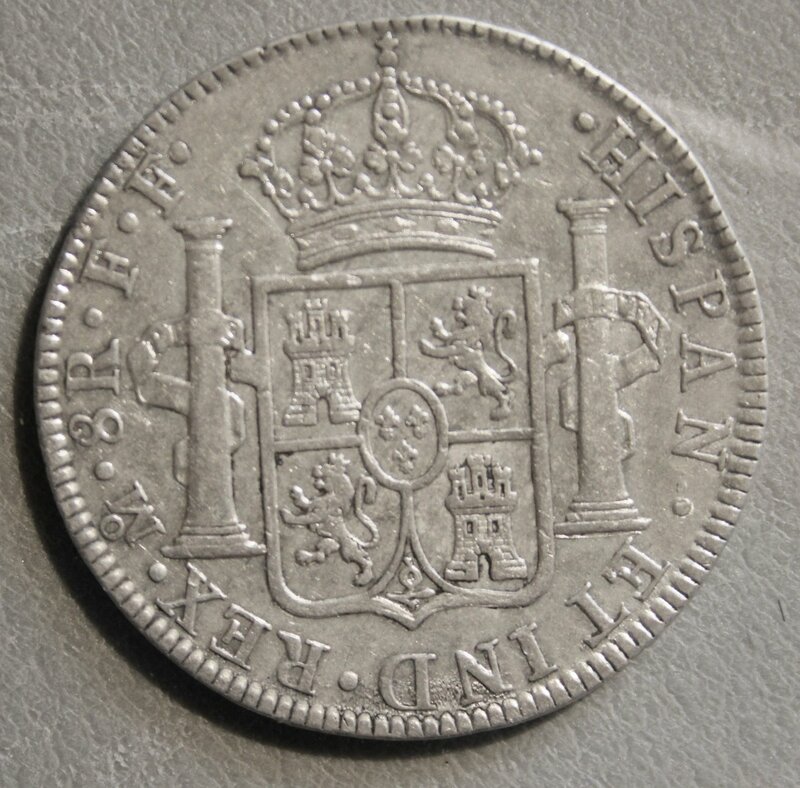 Was this a good price for an el cazador coin and is there a price guide for these coins? Your price falls within the normal range for these. In general, only coins that can be graded will have a value you can look up in a price guide. The best way to check a value is to look at comparable items in auction archives (e.g. ebay listings for sold items). I'd be careful with that line of thinking. Just because something is in an NGC or PCGS slab doesn't make it automatically genuine, as we have seen far too many times in this forum. Especially with 8Rs, there are way too many instances of TPGs certifying non authentic coins. Once I got a counterfeit coin in a counterfeit slab but doesn't the TPG company guarantee its authentic when they slab it? Do you cableguy think that the NGC el cazador coin looks not authentic? It has a salt water corrosion look to it. I think cableguy815 was making a general statement and not referring to your El Cazador. That coin is one of many that was conserved and encapsulated for the salvager and Franklin Mint. NGC does not use that label for any other coins. Yes, what jgenn said. I am absolutely unable to comment on the authenticity of your example. I personally wouldn't collect such a coin as it is not in my scope of interest, but I certainly understand the historic allure. My point to you was to be careful with the "if it's in a TPG slab, it's 100% authentic" mentality. Aside from the fact that there are loads of fake slabs out there, there are also plenty of genuine slabs with fake coins. Getting a TPG to honor said guarantee is also no easy process (you got to read the fine print), as many a person on this forum can attest to. And even if you do get a TPG to honor their guarantee, I think the amount a TPG would pay you (their idea of Fair Value) and what you think they should pay you (your idea of Fair Value) can be greatly different. I apologize, it is not my intent to frighten you and paint TPGs in a bad light, but to merely adjust your way of thinking slightly and to get you to think about the value you put on a TPG's slab. very good explanation cableguy...thanx again for your input..